← Game of Thrones : Purple Wedding Death Scene – Sure, Blame the Wine! Pinot noir is a the signature wine of the state of Oregon, whose devotees of this tiny grape are passionate and, I think sometimes, just a bit snooty about it. There is an exclusive club for people that love pinot noirs , and up until recently, I wasn’t one of them. Until this year, I couldn’t understand what all the fuss was about. I am a late comer to the party having moved to the Northwest in 1989, and started my wine education with the bigger bolder flavors of the zins and syrahs of Washington state. Pinot noirs is a wine style that I had not immediately embraced. I don’t think that my wine palate was ready for it until this year when I first tasted the pinots of Sonoma Valley in California. I found that the medium weight of those wines allowed me to appreciate the grape better, or to express it another way, allowed me to experience the Oregon pinots all the better. That’s why, when I had a chance for a quick 3 day trip to the North Willamette Valley, just south and west of Portland, I was going to make a point with an open mind, to immerse myself in some pinot noir. I made the 4 hour trip from Seattle to Newburg, Oregon which is the gateway to the Chehallem AVA -Region 4. As we drove south, signs of Fall were emerging in the landscape, slight golden edges to the leaves along the highway, and the air temp was super warm, just like the last final hurrah of summer should be. 95 degrees and no air conditioning in my car, means my hair was a tangled mess by the time we hit our first tasting room. and beauty of that region. Breathtaking. The wines were nice, and although we got to taste through a few pinots of course, the standout was the 2013 Pinot Blanc. A bright, crisp with apple notes wine, with just enough minerality for your tongue to linger over. They also shared their Arneis white wine, a grape traditionally from the Piedmont region of Italy. They are one of the handful of growers in the U.S. and I would love to taste this again in a few years. 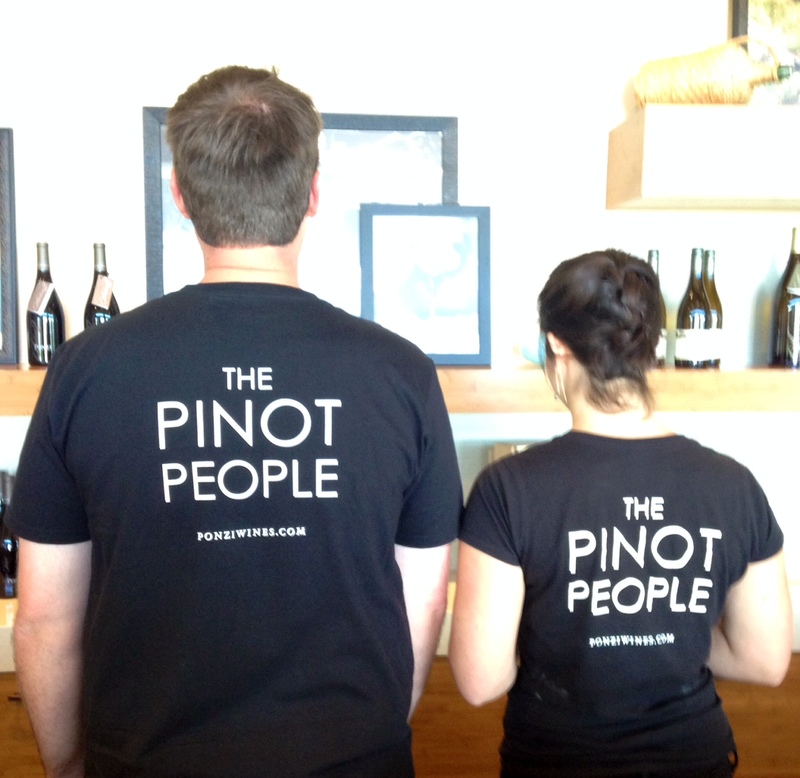 The tasting room crew were great, knowledgeable and I have to say, their t-shirts rocked. Since it was my first stop, I just tasted their pinots using them as a base line for pinots down the road. I will say that one Pinot Noir 2011 -Willamette Valley stood out and was a begging me to buy a glass and stop to take the views in. But no, we have more to discover. More in Part 2 to be shared. 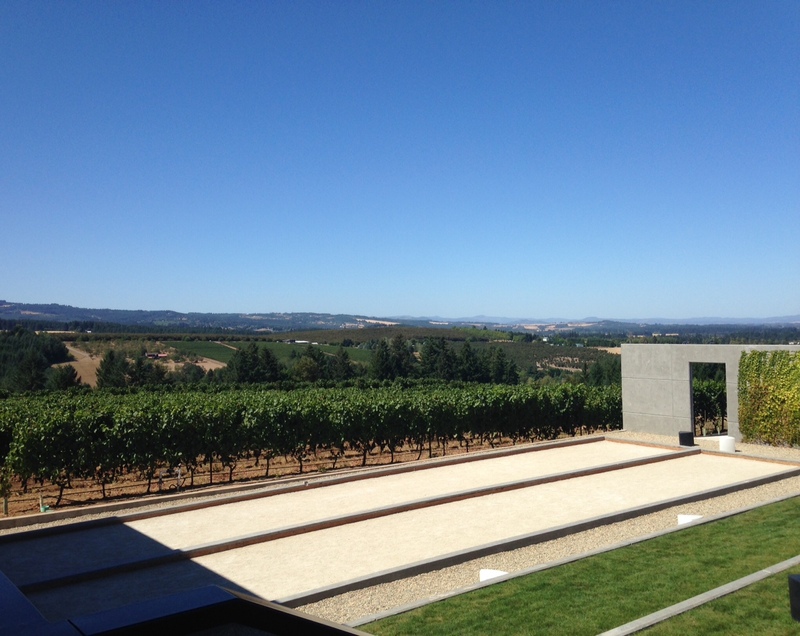 This entry was posted in Uncategorized and tagged Oregon wines, pinot noirs, Ponzi Vineyards, Willamette Valley. Bookmark the permalink. Great post, looking forward to part 2! Like you, I used to find Pinot Noir too lightweight, but a few great examples converted me. Central Otago remains my favourite still. Central Otago? More detes please, always like getting recommendations. Thanks!